It's that time of year....Book Challenges. 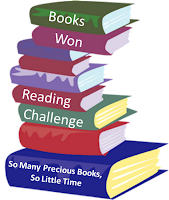 I just found another one that I can't resist -- the Books Won Reading Challenge hosted by Teddy Rose from So Many Precious Books, So Little Time. 1. You must write a review for each book that you read for it to count. If you do not have a blog you can write your reviews on a place like Amazon, Powell's, Chapters, etc. 2.Crossovers with other challenges are okay. 3. Audiobooks count, as long as you won them. As do won e-books. 4. You can change up levels but cannot go back down a level. 5. Make a list of the books won that you plan to read for the challenge. You can always make changes to the list. To sign up, leave a direct link to your blog post about this challenge , using Mr. Linky below. Please leave a comment as well. I am going for the Bronze level (Read 4 - 6 books I've won) at a minimum. I'm hoping that I can use books read in this challenge towards some of my other challenges. If not, I'm in big trouble! The challenge runs from January 2 through December 31, 2010. This challenge sounds like a lot of fun, and I can definitely use an incentive for reading some of my books in my TBR pile! I'm doing this challenge, too, but didn't make a list! I guess I should go back and do that. Good luck! This is a great idea. I try not to enter to win too many books because I already have so many I need to get to. Any challenge that helps us get through the piles of books we already have is a good one, isn't it? !